EARLY MAN is the new prehistoric comedy adventure from four-time Academy Award® -winning director Nick Park and AARDMAN, the creators of WALLACE AND GROMIT and SHAUN THE SHEEP. Shot in Aardman’s own distinctive style, the film will take audiences on an extraordinary journey into an exciting new world unleashing an unforgettable tribe of unique and funny new characters voiced by an all-star British cast. Set at the dawn of time, when prehistoric creatures roamed the earth, EARLY MAN tells the story of courageous caveman hero Dug (Eddie Redmayne) and his best friend Hognob as they unite his tribe against a mighty enemy Lord Nooth (Tom Hiddleston) and his Bronze Age City to save their home. It seems strange for Aardman studios to go with a football story. Hero Dug (Eddie Redmayne) must gather a football team together so that he can defeat Bronze Age Tyrant, Lord Nooth’s (Tom Hiddleston) team, victory will then grant the freedom of Dug’s tribe and give them back control of the valley where they stay. 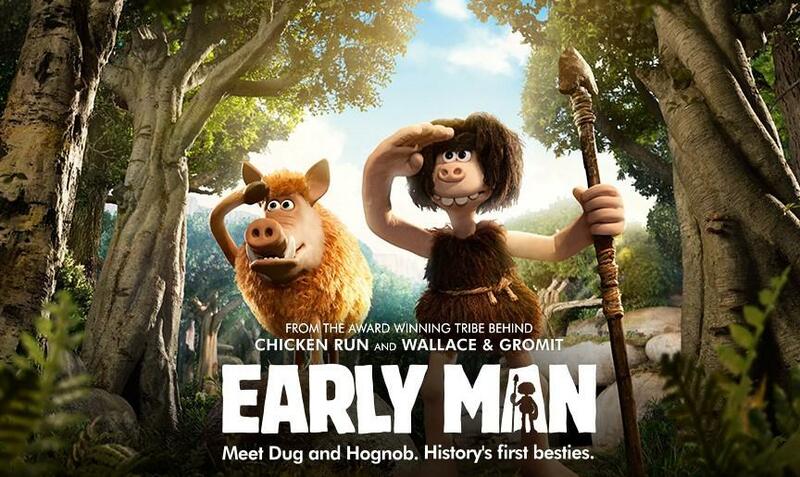 Previous films from the studio, Chicken Run and Shaun The Sheep to name but two, have had an international appeal, whereas Early Man feels so very British. The animation is at times stunning and the voice cast are all good. Sadly great animation and wonderful voice work don’t always make for an excellent film. Early Man gets off to a good start in the first half but quickly runs out of steam in the second half with jokes feeling forced and at times corny. Early Man is not bad, it’s just not a patch on Aardman studios previous outings.